The United States Supreme Court ruled that limiting Burger King's advertisements to the truth is a violation of the First Amendment. WASHINGTON, D.C. – In a controversial ruling, the United States Supreme Court eased legislation to allow companies more freedom when advertising products and services including allowing for statements that are not proven true. Ruling on the case of Burger King vs. USA, the justices found that Burger Kings’ claim of “Our burgers won’t give you AIDS, but McDonald’s will” is protected under the First Amendment and therefore legal. McDonald’s sued Burger King after an ad, which featured a healthy, happy person eating a Burger King hamburger and a disease ridden, homeless person eating a McDonald’s hamburger. 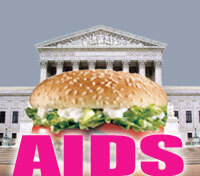 The word “AIDS” flashed in bright red and green letters whenever McDonald’s was mentioned or shown in the commercial. McDonald’s argued that the commercial was slander and socially irresponsible. Kaiser continued to say that now that the court has ruled, McDonald’s will respond appropriately. The decision was split 5-4 with Chief Justice John Roberts writing the majority and Justice Ruth Bader Ginsburg writing the dissent. The ruling has already opened up a flood gates of commercials featuring false statements. In addition to commercials for products and services, this ruling is expected to play a major role in advertising for the upcoming Presidential election in 2008.